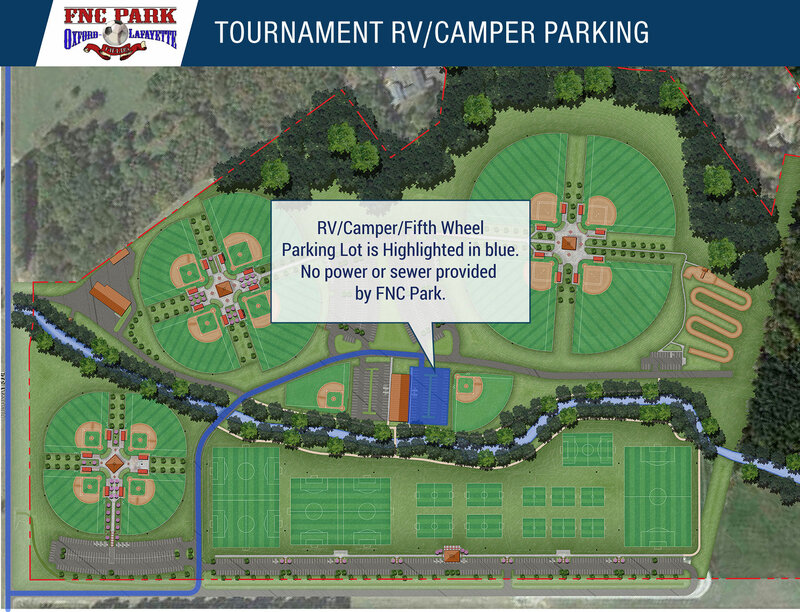 FNC Park offers over 950 parking spaces with handicap parking, some select handicap spaces are van accessible. Our Oxford Ortho IPF provides additional parking for soccer games as a conveniently located walking bridge allows our patrons quick and easy access to the soccer fields in addition to the soccer parking lot. We take pride in our fields and our grass so we ask that our patrons park in parking spaces and not on any of the common area of field grass. Please do not use parking spaces for grilling, setting up tents, or any use other than parking your vehicles. We offer special parking for RV’s, fifth wheels and campers. Please use the maps below to adhere to our parking guidelines for those type vehicles. Our Indoor Practice Facility sponsored by Oxford Orthopaedics has 6 retractable batting cages, artificial turf and observation deck for parents to watch.